The prized bronze trophy Floyd of Rosedale is safe for yet another season as Iowa scored on its first drive of each half to win a Big Ten West Division Game 17-10 at Kinnick Stadium in Iowa City. If you enjoy offense, it wasn’t pretty for fans of either team. If you like defense, it was another great effort by the Hawkeyes. Iowa had its best offensive start this season, receiving the opening kickoff and storming down the field to take the early 7-0 lead on a drive that went 80 yards on five plays that took just 2:23. It matched that effort to start the second half and open a 14-0 lead on a drive that took just 2:25 to go 67 yards on five plays. Both drives included big plays and passes that helped open up the running game. Iowa hadn’t scored on its opening drive of a game all season until this game – and had only scored once on its second half opening drive. But offensively, that was it except for a 32 yard field goal by PK Miguel Recinos to give the Hawkeyes a 17-7 lead with 4:28 left in the game. If Iowa’s Offense struggled, Minnesota’s was even worse. The Gophers rely on their running game, averaging 4.2 yards per carry and 188 yards on the ground per game with 12 rushing touchdowns. The Hawkeyes Defense held that to 142 yards rushing, 3.3 YPC, and just the one TD. The passing game was even worse. Minnesota’s starting Quarterback Demry Croft completed just 9 of 29 passes for 139 yards and one interceptions – 63 of those yards came on one pass late in the fourth quarter but that drive stalled and ended with a 33 yard field goal to cut Iowa’s lead to 17-10. Iowa’s defensive secondary had an outstanding game, including CB Josh Jackson who finished with four PBUs including a tipped pass in the end zone that resulted in the interception by FS Jack Gervase. The Hawkeyes also sacked Croft four times for 20 yards and pressured him much of the game. Iowa QB Nate Stanley finished completing 15 passes on 27 attempts for 190 yards, one TD, and one pick. The TD pass was 45 yards to TE Noah Fant. Stanley has now thrown 17 touchdown passes this season against just four INTs. Running Back Akrum Wadley finished with 70 yards on 16 carries including a 12 yard TD run on the opening drive. 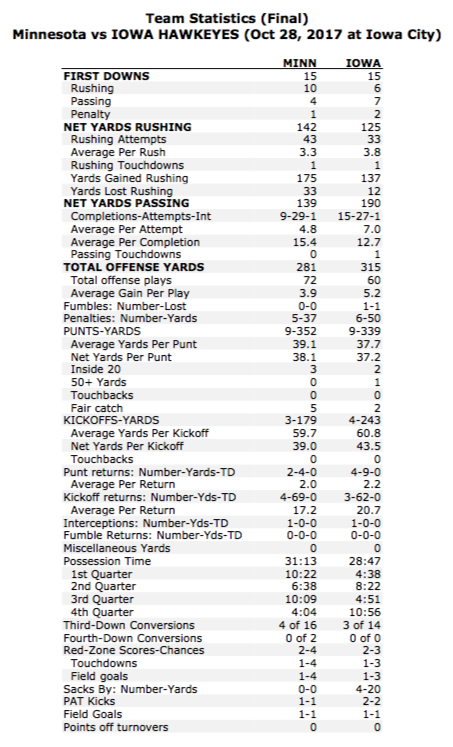 The Hawkeyes finished with 315 yards of total offense – 190 passing and 125 rushing. Iowa did fumble the ball once (RB James Butler who returned to play for the first time since an elbow injury in the North Texas game). 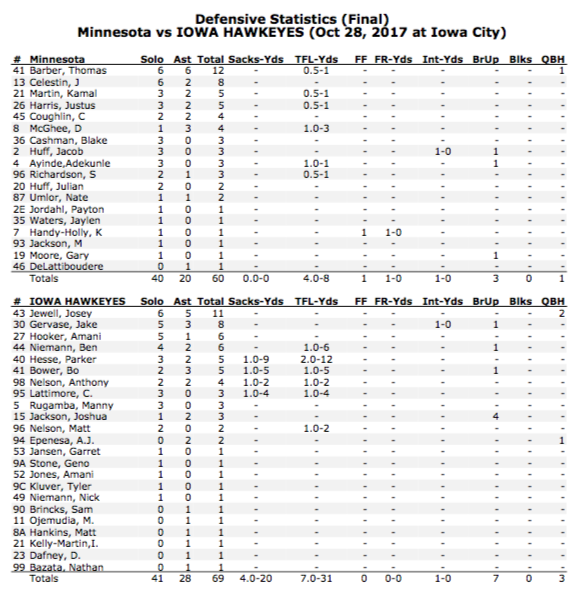 The Hawkeyes were also hurt by critical penalties, ending with six called for 50 yards. One interesting note, at the Half Brian Ferentz led the coaches out of the press box heading to the Iowa locker room and unleashed a very loud string of obscenities apparently aimed at the Big Ten Officials Replay Booth. This followed a controversial review of Butler’s fumble near the end of the second quarter and likely cost Iowa some points at the end of the first half. In his post-game press conference, Head Coach Kirk Ferentz said the will gather all the facts and then address what he termed unprofessional behavior. This was the third game of the year that ended 17-10 – and the first one of those that the Hawkeyes won. They previously lost by that same score at Michigan State and at Northwestern. Iowa has now defeated Minnesota eight straight times at Kinnick Stadium and has retained Floyd of Rosedale 13 of the last 17 games overall. The Hawkeyes have successfully defended two of its four rivalry trophies this season – the Cy-Hawk Trophy vs. Iowa State and Floyd of Rosedale vs. Minnesota. They will try to regain the Heartland Trophy at Wisconsin and Iowa will try to defend the Heroes Trophy in the season-ender at Nebraska. Overall Iowa has won nine of their last 10 trophy games. Iowa (5-3, 2-3) remains home to face Ohio State next Saturday at Kinnick Stadium. The Buckeyes are coming off a thrilling come-from-behind 39-38 victory in Columbus over previously undefeated Penn State. Minnesota travels to Ann Arbor next Saturday to face the Michigan Wolverines. 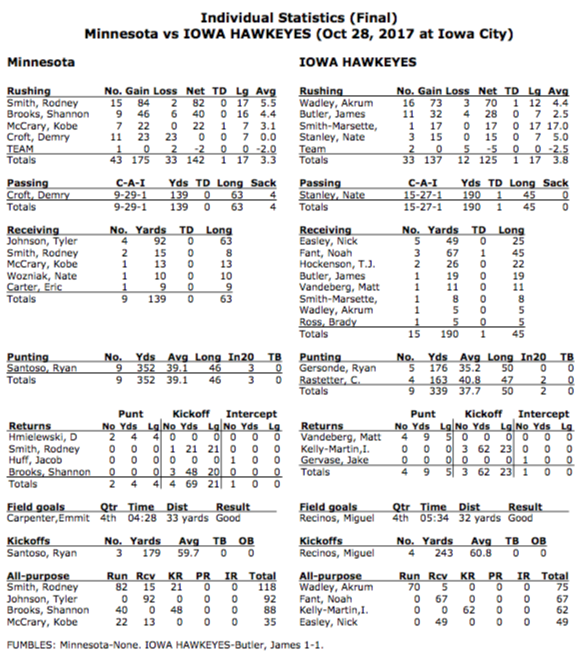 Iowa (5-3, 2-3) defeated Minnesota (4-4, 1-4), 17-10, Saturday at Kinnick Stadium. Iowa has won 13 of the last 17 meetings in the battle for Floyd of Rosedale. The Hawkeyes have won the last eight games in the series played in Iowa City. Iowa has successfully defended two rivalry trophies this season (Cy-Hawk, Floyd of Rosedale). Iowa will defend the Heroes Trophy on Nov. 24 at Nebraska, and try to regain possession of the Heartland Trophy at Wisconsin on Nov. 11. LB Josey Jewell returned to the starting lineup after missing last week due to injury. Jewell led the team with 11 tackles. He has 18 career games with double-digit tackles. Jewell has 382 career tackles, and tonight he passed Fred Bar for No. 7 all-time in program history. FS Jake Gervase made his fifth start of the season, recorded a career-high eight tackles, and recorded his first career interception. DB Josh Jackson had a career-high four pass breakups. Jackson entered the game leading the Big Ten with 11 pass breakups. DE Anthony Nelson ended Minnesota’s final drive with a sack, Iowa’s fourth of the night and Nelson’s sixth of the season, tying a career-high. WR Matt VandeBerg had one reception for 11 yards. He has at least one reception in 27 consecutive games played. He has 125 career receptions, 11th all-time, and 1,589 receiving yards, 17th all-time. He passed Ed Hinkel on Iowa’s all-time list for receiving yards tonight. WR Nick Easley had a team-high five receptions. He has led Iowa in receptions six times this season. RB Akrum Wadley’s 12-yard TD rush in the first quarter was his 30th career touchdown. He is the sixth player in program history to score 30 career TDs. Wadley has 23 career rushing touchdowns, tying for sixth all-time. His 180 career points rank 12th all-time. Wadley has 3,182 career all-purpose yards, 12th most in program history (2,406 rush, 676 receiving, 100 KO returns). He passed Owen Gill and Fred Russell on Iowa’s all-time list tonight. RB James Butler returned to action for the first time since Week 3. Butler had 11 rushing yards on 28 carries in his Big Ten debut. TE Noah Fant’s 45-yard touchdown reception was the longest reception of his career, and his team-best fifth TD reception. Iowa scored on its opening possession for the first time this season (RB Akrum Wadley 12-yard TD rush). Iowa scored on its opening possession of the second half (45-yard TE Noah Fant TD reception) for the second time this season (North Texas). Iowa held Minnesota to a season low in points. Iowa’s defense pitched a first-half shutout for the second straight week. It was the first time this year Minnesota was shutout in the first half. Minus the 63-yard pass in the fourth quarter, the Hawkeye defense allowed only 75 yards in the second half. Since 2014, Iowa is 13-10 in games decided by one possession. The Hawkeyes are 2-3 in one possession games this season. Iowa won the toss and elected to receive. The Hawkeyes have played 235 games under head coach Kirk Ferentz. Iowa has opened the game on offense 181 times (110-71). The Hawkeyes have opened the game on defense 54 times (30-24). Iowa has played three 17-10 games this season (1-2). Iowa improved to 11-5 all-time in night games played at Kinnick Stadium. Tonight’s win was the 399th home win in program history. The Hawkeyes are 399-218-16 at home. Minnesota first down, runner made the line to gain (call overturned). James Butler downed by contact, no fumble (call overturned). The Hawkeyes host Ohio State on Saturday, Nov. 4. A start time has not yet been announced.